With some big gift-giving holidays coming up, I’m posting this excerpt from Bleating Hearts, in which I expose the popular practice of giving animals as a way to alleviate hunger and poverty. The concept sounds wonderful to many people: Help end hunger by providing a farmed animal to an impoverished family. Every November, just in time for the holidays, the mailboxes of compassionate people in developed nations become stuffed with glossy pleas from a seemingly endless procession of give-a-cow nonprofits, some endorsed by celebrities and all asking you to donate funds that will supply animals to the poor. 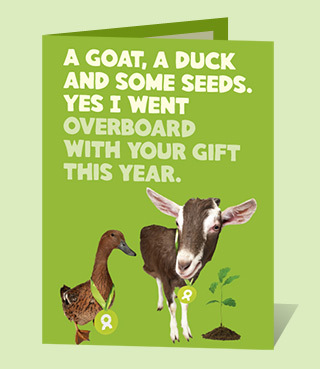 For US$75, World Vision will send a needy family a goat, or a donation of US$30 will buy them five ducks. Harvest of Hope, meanwhile, offers a bull, plow, and seeds for a Ghanaian farmer for US$850, and US$45 will buy a pig whose “offspring are raised and sold for a profit, giving a family a steady source of income,” reads the catalog. 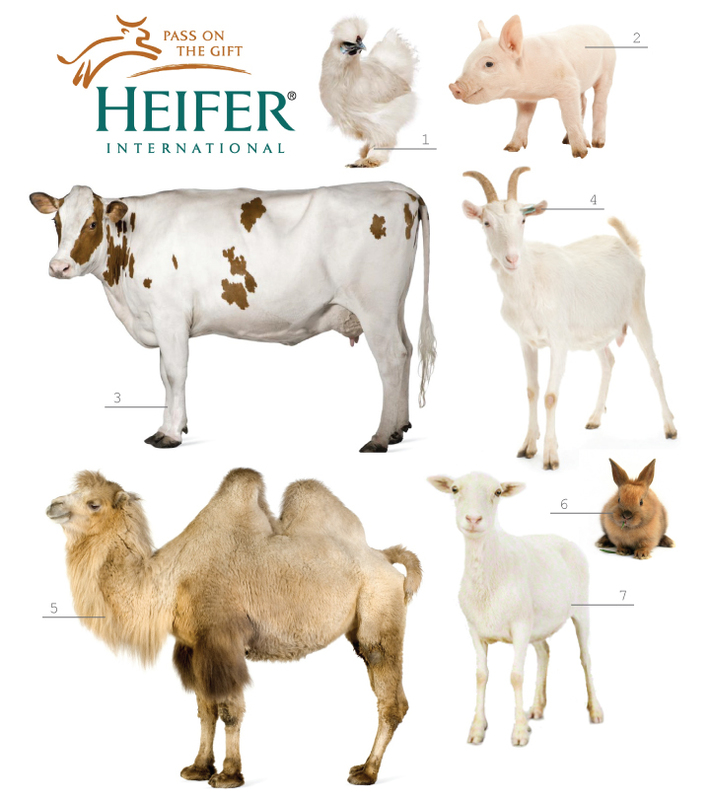 A Heifer International catalog encourages grandparents to donate the cost of rabbits (US$60) in honor of their granddaughter’s first Christmas. “What better way to share the joy you see in the eyes of such a healthy, happy little girl than to make a gift in her name that can help provide a trio of bunny rabbits … that helps impoverished families increase their protein intake and income.” I wonder how the little granddaughter would feel seeing these precious animals slaughtered. Most would agree that helping struggling rural families along the road to self-reliance is a laudable goal. Yet, apart from perpetuating what amounts to a nonhuman slave trade, giving to programs that exploit animals makes no economic or environmental sense. Consider the family that is provided with a cow or goat from whom they can take milk for nourishment and a little income. Ignoring the consequences of giving gastrointestinal complications to the 90 percent of African and Asian adults and older children who are lactose intolerant—does a hungry child really need diarrhea to add to his misery?—animals require proper food, large quantities of water, shelter, and care, including occasional medical treatment. Just how is a disadvantaged family supposed to provide for one or more animals when feeding themselves is a challenge? World Vision encourages donors to exploit animals in the name of Jesus. In addition, Animal Rahat (relief) is a nonprofit organization created to make a difference in the lives of working bullocks, donkeys, ponies, and horses in India. Thank you for addressing this issue. Being that I’m an ARA and aspiring vegan, my mom gave me a Heifer catalog recently; just because of the fact that I love animals and want to help, in her eyes. Also by being an animal rights activist, I do not support using and exploiting animals for our gain, i.e. animal agriculture, among others. Agreed, to support these organizations is that of hypocrisy and deceit; and is definitely not an option for someone who advocates to protect and ensure the well-being of animals, as well as the environment. Needless to say I will be showing her this post. Thanks for your comment — and for sharing this post! Please consider effective, humane alternatives to help combat hunger and help people in need. Choose compassion, respect and love for both — people and animals. Thanks for this great article and for giving us a shout out!